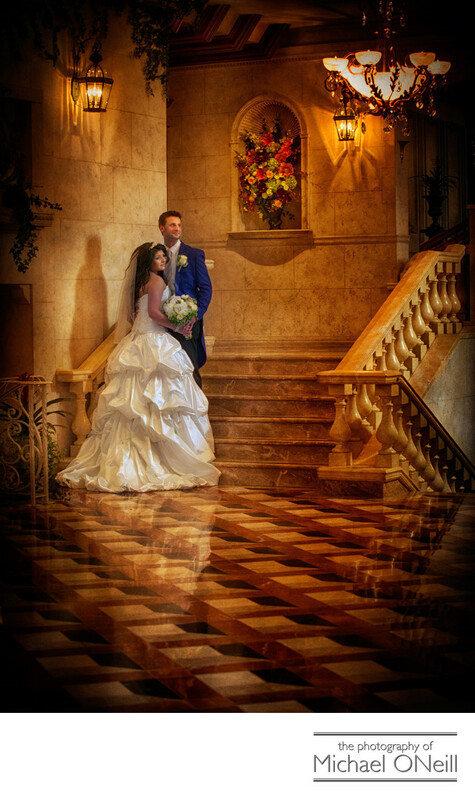 A great deal of my experience as a professional wedding photographer in catering venues in Nassau County, Long Island, New York are in some of the most beautiful Gold Coast mansions. I regularly photograph weddings in the Glen Cove Mansion, The deSeversky Conference Center in Old Westbury, NY, Oheka Castle and The Royalton at Roslyn Country Club. Jericho Terrace in Mineola is anything but an old vintage estate. It is a modern catering venue located right on Jericho Turnpike in Mineola, NY, yet it’s architecture rivals some of the most beautiful estates out on the island east of New York City (NYC). This picture, taken right inside the main lobby of Jericho Terrace will give you some idea of the amazing surroundings at this reception hall. The classic marble floors and the stone railings rival anything in the mansions of Long Island. Furthermore, they offer indoor balconies, a grand piano, beautiful fireplaces and some of the most exquisite ballrooms for a Long Island wedding reception. Outdoors is a one-of-a-kind terraced garden with it’s own waterfall. Jericho Terrace is a beautiful venue for wedding photography on the nicest of days or even if you are unfortunate enough to experience inclement weather, such as rain or snow, on your wedding day. A great photographer can turn a venue like Jericho Terrace into the most of beautiful of backdrops for truly elegant wedding photography. If you are planning a Jericho Terrace wedding give me a call here at my studio and gallery. I would love to talk to you about your plans for your wedding photography and would feel privileged to work with you on your big day.